For Sibiu, a city over eight centuries old and a convergent point of numerous economic and spiritual influences, musical manifestations have been a constant part of the city life. Since the 16th century, Sibiu had one of the first European schools for organ, funded by Heronymus Ostermayer and the city’s archive contains music scores signed by composers of the 17th and 18th centuries. It was in 1774, at the court of Samuel Brukenthal, governor of Transylvania, when a professional orchestra held its first concert. In 1792, one year after Mozart’s death, “The Kidnap from Serai” was played in Sibiu, and later in 1800, the “Creation” Oratorio by J. Haydn. During the 19th century, great European musicians played in Sibiu: Franz Liszt, Johan Strauss, Johannes Brahms, Joseph Joachim, Richard Strauss and others. This musical activity was sustained and continued by both Romanian and German cultural societies until mid 20th century. In the context of the existence of such a great number of musicians, of a music conservatory, and of a great tradition in the field of symphonic and opera performance, the State Philharmonic of Sibiu was funded on January 1st, 1949. 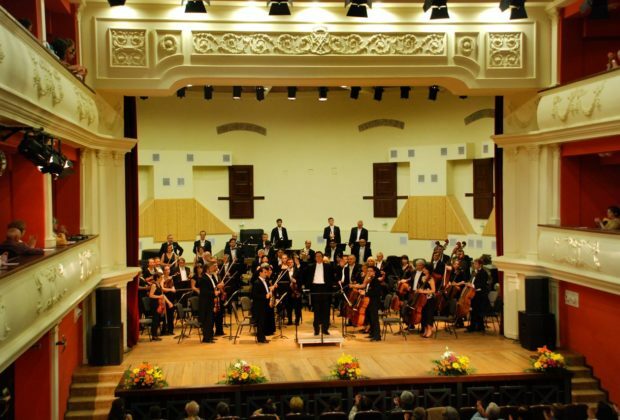 The Philharmonic of Sibiu was and continues to be a professional institution that, during its 50 years of existence as a state institution, offered thousands of symphonic and opera concerts, accumulating a vast symphonic and lyric repertoire. Numerous articles in Romanian and foreign newspapers and magazines praised the quality of the orchestra’s concerts and of the recordings for radio and television, or on discs and CD’s. At the same time a great number of tours were successfully concluded in the country and abroad, in France, Germany, Italy, Austria, Spain, Russia etc.